Graph theory is one of those things in the computer science field that has the stigma of being extremely hard and near impossible to understand. My goal for this post is to introduce you to graph theory and show you one approach to finding the shortest path in a graph using Dijkstra's Algorithm. Don't worry about learning everything in one go. If you can walk away with a few concepts and one or two things implanted in your memory you're well on your way to understanding path searching in graph theory. I'll be deviating from python and going with ruby for this post. If you're here for your usual dose of python code feel free to follow along and reference the code at the very bottom of this post where I've completed a python implementation. Python and ruby are similar enough where you should be able to understand most of the code though. Just need one gem for this one. PriorityQueue will allow us to have a heap where we can change the priority and have the tree automatically rebalance which is nice. In the computer science world a graph is a data structure that represents a connected plot of points. You can kind of think of the points (verticies) as cities and the lines (edges) that connect those points as roads. If you're familiar with trees you can think of it as a tree where a node on the tree can link to many or no other nodes on the tree. You can use graphs to do all sorts of cool things such as find a person's Bacon Number, find all the Married people who like Prostitutes, or get directions to my house. This is a picture of the weighted graph we'll be implementing/searching. A weighted graph simply means that the edges (roads) of the graph have a value. In our case we'll be using that value as a distance. It's a rather small graph but it will definitely help to give us an idea of how we can efficiently search a graph. Inplementing this graph is only a few lines for the class and some calls to our add_vertex method. Here's the code to add the rest of the verticies to match the graph picture above. Feel free to add your own and make your own graph. As long as the weights (distances) are positive the algorithm will work. Back before computers were a thing, around 1956, Edsger Dijkstra came up with a way to find the shortest path within a graph whose edges were all non-negative values. To this day, almost 50 years later, his algorithm is still being used in things such as link-state routing. It has also been extended by others to create more advanced path finding algorithms such as A*. If we wanted to find the path from "A" to "H" we'll start at "H" and work our way backwards. We already know the distance from "A" to "H" is 12 so we just need the path that we took to get there. So starting from "H" we see the shortest path came from "F". The shortest path from "F" to "A" was through the vertex "B". The shortest path from "B" to "A" was the direct path we have "B" to "A". Therefore our path is A → B → F → H.
Maxint will serve as our infinity. Distances will be a hash that stores the vertex and the distance from our original source vertex. Previous will be a hash that stores the vertex we came from to get to this node in the shortest path. Nodes will be our min-heap that holds unvisited nodes. Let's now go ahead and initialize the values of our variables. Now we want to start churning through all the nodes. So let's grab our min heap and pop off (in this case the method is called "delete_min_return_key") the smallest vertex, or basically the vertex with the shortest distance from the start vertex which we have not yet visted. For the first run through this will always be the source node since the distance is set to 0. If we ever pop off a vertex with maxint as the distance than we know there are no more paths to the source node so we can just return. If we try to pop off the heap with nothing there then smallest will be nil so we should also check for that as well. Both of these conditions essentially mean we've exhausted all search efforts. Say our source node is "A". That means that A's neighbors are "B" and "C". When looping through the neighbors we'll start with "B". We take the distance "A" is from "A" (0) and add it to the distance "B" is from our current vertex (not the original source, they just happen to be the same in this case) which is A. 0 + 7 = 7. We then compare this number to the distance "B" is from the original source. Since we haven't calculated this value the distance is set to our maxint variable. So we can then go ahead and update our distance of "A" to "B" as 7 and set an entry in the "previous" variable as the shortest path from "A" to "B" is through A. We then go ahead and update our min heap to say that the shortest distance from our original source to any node is 7. The first node in the min-heap (nodes variable) is 'B' => 7. With just this code we can go ahead and return the distances hash after the while loop finishes and we'll have the distance each node is from "A", our start node. Since our smallest node is our finish node we check which vertex got us there using the "previous" variable and add that to our path variable. Then we check which vertex got us to that vertex and so on and so forth until we reach our start vertex. When we reach our start vertex the associated value in the previous hash will be nil which will cause the while loop to exit and return the path. I know a lot of my readers are pythonistas so I've also went ahead and did a python implementation. You'll notice in the relax section there is some extra code. This is me just rerunning the heap since the builtin heapq module doesn't have the ability to modify priorities and have the heap be resorted. If you're familiar with the module you could go ahead and call the internal _siftdown(nodes, node_index, len(nodes)-1) method but that's not really recommended. You can grab the source from this post at https://github.com/mburst/dijkstras-algorithm. I encourage you to implement this in another language or in a different way than I have shown and submit a pull request. I think it would be cool to have a huge collection of implementations from different people. My .NET implementation using Generics has been available at http://www.sbrickey.com/Tech/Code/Dijkstra_s_Algorithm_in_C_with_Generics I used it because I was querying AD directly, and needed to be able to determine the best (closest) domain controllers. This excellent website certainly has all the info I needed about this subject and didn't know who to ask. I've never used Ruby but should the check for the empty priority queue / maxint distance be reversed? distances[smallest] == maxint or smallest == nil If smallest is nil, what happens when you try to evaluate distances[smallest]? Indeed you are correct. Good catch! I've updated my post to reflect this fix. distances[nil] will throw: TypeError: no implicit conversion from nil to integer. Why not use "infinity" if it is available anyway? Just set (preferably a constant) to 1.0/0 and there you have it. Yea that would absolutely work. I'm sure there are but I don't have any links or recommendations off the top of my head. I'm a huge fan of what I like to call Wikipedia programming. A lot of algorithm related articles have sudo code for them. Python and Ruby lend well to sudo code examples. I'd recommend checking out http://en.wikipedia.org/wiki/Shortest_path_problem#Algorithms and trying to implement ones you find interesting/useful. If you run in to any trouble with them feel free to shoot me a message and I'll help you out the best I can. Hi, Just the thing I needed, and it runs ~20% faster then the next best thing I found (http://code.activestate.com/recipes/119466-dijkstras-algorithm-for-shortest-paths/)... at least on my data set. I'd like to use this code as a basis for a path-finding AI for a game (non-profit or not-likely-to-make-a-profit). Are there any legal restrictions(license) on your code? Can I use it for that? How should I credit You? Sorry for not getting around to answering this sooner. You're free to use any code posted on this site in any way you'd like. A link back to this article is always nice in the comments but in no way required. Consider it an MIT license. Hello, I'm not a programmer, but...I've to write an algorithm with ruby for my last exam :(. Can you help me? Dijkstra or Floyd Warshall is the first step of the project. Hi there, I would like to know What does this line of code means : maxint = (2**(0.size * 8 -2) -1) How did you even know what are the values for maxint? Hi Tom, I was wondering myself. Here is some research: Fixnum holds Integer values that can be represented in a native machine word (minus 1 bit). If any operation on a Fixnum exceeds this range, the value is automatically converted to a Bignum. 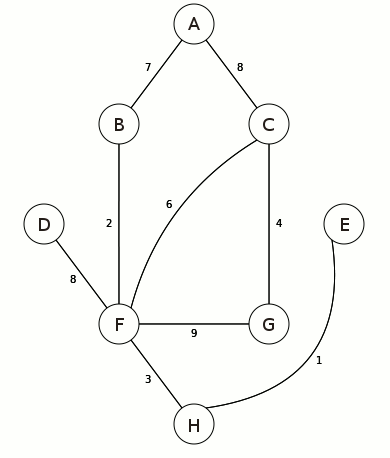 Informative article on Graph Theory. Thanks. As I am a programmer in Bioinformatics i would love to know about the programming using the Python language.I have got a good set of introduction over the topic. Good post. Nice way of making a beginner understand the language. It's full of information I am looking for and I love to post a comment that "The content of your post is awesome" Great work! I really am no programmer but this will certainly spark the interest of my boyfriends brother, will pass it on to him. I implemented this in another language and the outcome is amazing, thank you for this code. Well done. I tried to implement this into another language, but struggled a bit with the outcome, so reverted back to yours. Definitely one of my favorites. I just love the python implementation, nothing better for me!! Love it. Source codes are definitely not my forte, but loved reading this, some very helpful hints and tips in here, might just give it another go soon. Text Your Ex Back by Michael Fiore gives you instant, online access to a simple, step-by-step system in which Mike teaches you his powerful secrets, techniques, and unique method for quickly and easily reconnecting with your ex through the use of specially crafted text messages and texting formulas. I have bookmarked it and I am looking forward to reading new articles.I am really enjoying reading your well written articles. It looks like you spend a lot of effort and time on your blog. Nice post.It is really very good post. Really cool, not much of an expert on this, but trying my hand at it and this is super useful, thanks. Super and cool info given. Very useful, will definitely try my own spin on it. Absolutely amazing, love reading all the positive comments. Thank you for a great post. Very nice. Love this post, the info is amazing and really helpful. Thank you for a great site. Paradoxically, baseding on electric motor trade specialists, the insurance coverage business could cut its losses by doing this. When it come to products carriers, which enjoy subsidized diesel and subsidized insurance coverage premiums, it doesn't obtain much better compared to this. We comprehend the insurance coverage demands of the electric motor profession and also would welcome the chance to recommend you even more. In charge of the insurance provider's picture as well as responsibility to insurance policy buying public and employers to prevent blunders. Very cool, will definitely need to pass this onto my students. Oh wow, this is really helpful, thank you for the insight. I was looking for a quick answer for this. Thanks for posting this and making my life so much easier. Great blog. Really interesting approach. Love your explanation, and approach, very simple actually, thanks. This site is a leading resource for information about the Thomas Coleman Tinnitus Miracle PDF book and complete tinnitus cure that teaches you unique and rare tips on how to naturally eliminate the ringing in your ears and keep it from ever coming back. Memory difficulties continue to worsen, there are significant personality changes, which require extensive help with customary daily activities. People in this Alzheimer's stage are not aware of recent experiences, events or their surroundings. They need to be taken care of for 24hr/day. I found this post quite insightful and interesting, I'm not much of a tech person, but this is valuable. The high-def videos and real demonstrations with women from the audience also mean you get to pick up on things like tone of voice, delivery, and body language which is something you just can't get from reading a typical ebook. I saw a similar post a while ago, also helpful but didn't have as much detail as yours. Thank you for filling in the gaps that I missed. Great post. I have to admit that I didn't understand this too well, then I sat step by step and I'm glad to say you are a genius. Thank you so much for the info. Really interesting and informative. Well done on a great and interactive post. Love it. When people recuperate with this system, they get to determine how to compress excessive body fat and how to burn it for good. Best explanation I have found by far, and I have seen a few, thank you. Love this post. Definitely tried implementing it in another language, and it came out amazingly. Thank you for the advice and tips. Fantastic that a young mind such as yours can create this. Well done, and all the best of luck for the future. Well done, this is quite interesting, very useful. Scala, well no need to say more. Great post. Very good catch on this. New in the industry and you have quite a good post here. If we ever pop off a vertex with maxint as the distance than we know there are no more paths to the source node so we can just return. If we try to pop off the heap with nothing there then smallest will be nil so we should also check for that as well. Kwaliteitparket.nl is fabrikant en leverancier van verschillende soorten Parket, Massief parket, Traditionele Tapis parket vloeren, Bourgogne Parketvloeren, Design parketvloeren en Visgraat parketvloeren vloeren. Onze parketvloeren zijn alleen verkrijgbaar in verschillende houtsoorten, kwaliteiten, breedte en dikte. Doordat wij zelf ruwhout importeren en verwerken zijn wij in staat een zeer breed assortiment aan te bieden tegen de meest scherpe prijzen voor de beste kwaliteitsproducten. E-Factor Diet Review: Facts And Figures Every Consumer Should Know About John Rowley's Guide to Increase Your Fat Burning Hormones. Below you will find the important facts and figures I feel every consumer should know surrounding John Rowley's E-Factor Diet book and complete guide for taking necessary precautions and improve weight loss simultaneously. Consumer graph is very complicated, the consumer buying process. Such a cool post, thank you for the codes, came in quite helpful. Love this post, even if it's a bit old, still helpful and cool. Really helpful post, thanks for the data supplies. Great take on Python. Short and sweet and to the point, thank you. So glad I didn't miss this, stumbled upon it by accident and super glad I did, seriously need to share. Oh wow, you have an amazing brain, would actually be interested in using this code in another project, will let you know how it goes. Love this code, have been using it for a while now and found your post a week or so ago, best ever. Best ever, and I have seen a few posts on this before, you have really simplified it so anyone can use this code, well done. So informative and interesting, not much of a tech person myself but found this quite useful. Fantastic post, well done and great job, absolutely loved reading this, will def forward. Absolutely love scala, great post. The functionality of this is quite outstanding, great job hey, you really do know what you are doing. Simple functions that can make a complicated problem so much easier, great article. I highly appreciate this post. I think you’ve nailed it! would you mind updating your blog with more information? I Really Liked The Font You’ve Chose To Use In This Article. Could I Please Get The Name Of That Font ? I Wanted To Use It In My Project Now. Thanks Very Much! Wow this post is awesome and very nice. Such a cool post, amazing blog. Scala is just the best, thanks so much, tried it on a different platform and it works wonders. Really cool post, thanks for the info, great stuff, keep up the good work. Brilliant, no need to say more, just brilliant. Just amazing. You are a brilliant mind and I really hope you still go far. Great Post ..! it very informative . Thanks for share it . Hey, Can you update it. gem 'PriorityQueue' not working as it is supposed to. new gem called 'pqueue' is released. They have some new way of implementing things. q = PriorityQueue.new q['hahoo']=1 this will give error. I found lots of interesting information here.Great work Thanks for the share loved reading the article, please do share more like this wiht us . Thank you for this amazing post, iv'e found your article very interesting. How do if i want print distance ? 2) In mean that if you have a vertex with odd number of connected edges you will anyway use one of them twice. 3) In your example you have 6 vertices with odd number of connected edges. One of them could be used as a start and one as a end of the path. So you will have at least 4 vertices with odd connection and at 4 least edges that you should use twice. 5) Consequently the minimum number of edges is 4/2 + 17 = 19. And you can easily find an example for it. Thank you for this great code!. If instead of trying to find the shortest distance between two points, I would like to find the shortest path that visits all the nodes, how will you do that? This is really a great stuff for sharing. <a href="https://www.marketingassignmentz.com/">help with marketing assignment</a> Thanks for sharing.